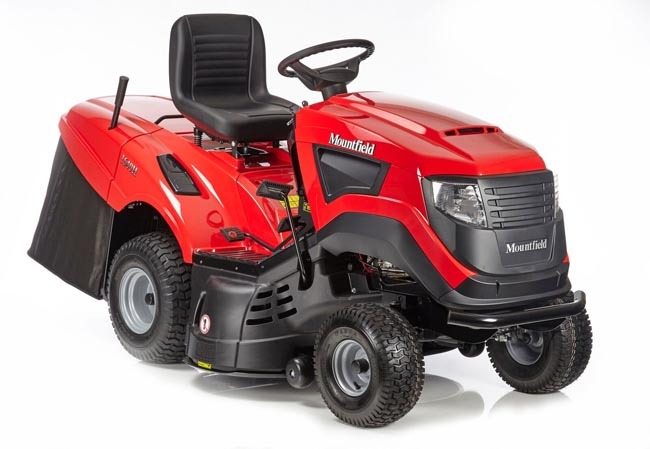 The Mountfield 1640H is a high specification, lawn tractor suitable for gardens with around 1.5 to 2 acres of lawn to mow. This model features the highly efficent Mountfield Cut and Collect system. The 102cm/40 inch cutting width deck has twin contra rotating blades that cut and discharge clippings into the large rear mounted collector in one smooth operation. Garden debris such as leaves and pine needles can also be collected in the same way. An alarm sounds when the collector is full and resets automatically after emptying. This is a useful feature and avoids the collector being overfilled and the discharge chute becoming blocked. The collector can be emptied without the operator leaving the driving seat. Cutting height can be easily adjusted from 25mm to 80mm in seven positions. An overall width of 105cm/42 inches and light steering with a tight turning circle with light steering Mountield 1640H very manoeuvrable. All Mountfield lawn tractors cut wider than the wheel width, reducing trimming of edges after lawns have been mown. The 1640H is powered by a 452cc Mountfield engine with electric key starting and has a foot controlled hydrostatic gearbox offering variable forward and reverse speeds and making changing direction very easy. This is ideal where there are tight areas of a lawn to negotiate and where obstacles in the area to be mowed make frequent changes from forward to reverse necessary. The Mountfield 1640H has an adjustable, high backed operators seat. The seat has a safety switch that stops the engine if the driver leaves the seat whilst the cutter blades are turning. The tractor’s dashboard has a six LED display to keep the operator fully informed. The Mountfield 1640H0 is supplied with a mulch kit for use when conditions are suitable to eliminate collection of grass collection and recycle clippings into the turf returning valuable nutrients to the soil as well as saving time spent on mowing. For more information on mulching, please visit www.mulching.co.uk. An optional rear deflector can be fitted for use when cutting long grass where collection is not required. A tow hitch is fitted as standard allowing trailers and a wide range of other trailed accessories to be used with this mower. The Mountfield 1640H is excellent value for money and in common with all Mountfield ride on mowers, offers low cost of ownership. We offer a very competitive fixed price service package for this machine. * Delivery of the Mountfield 1640H is included only to addresses in Norfolk and the Waveney Valley area of Suffolk. One of our own service engineers will deliver and install this machine. We provide full after sales support for all Mountfield products we sell from our branches at Horstead, Norwich and Toftwood, Dereham.